Young child’s brain requires an enormous range of nutrients like a mix of minerals, trace elements, vitamins, essential fatty acids, and other compounds. These all nutrients must come from the food the child eats every day. Diet makes a huge contribution to the emotional well-being and mental health of children and teens (and adults as well). Every parent must realize that food choices bear real consequences as children build their body and brains day by day with the nutrients parents supply. The good news is – it’s never too late or too early to make diet improvements. If the child has mood or behavioral problems, the first thing which needs to be done is assessing his diet for nutritional deficiencies. 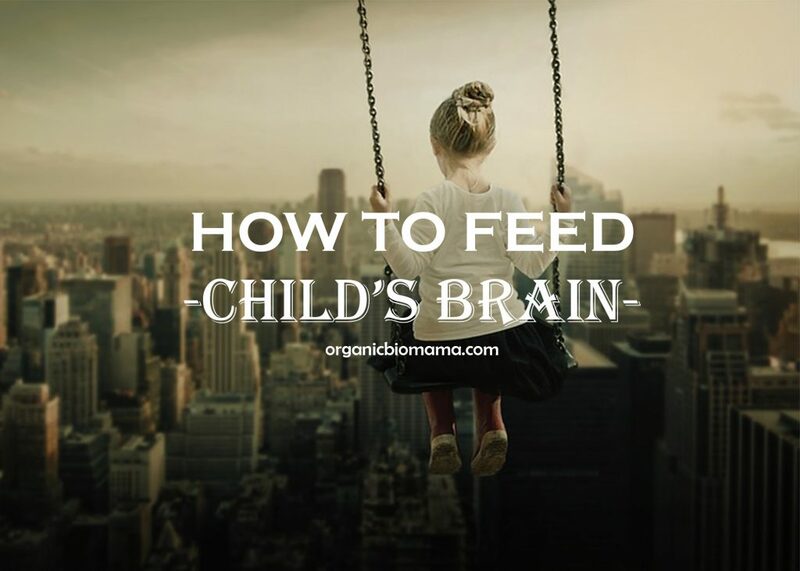 What kind of Nutrients are needed to Feed Child’s Brain? Nutrients consist of macronutrients and micronutrients. Protein: meat, fish, poultry, eggs, dairy, legumes, nuts, seeds, tofu. Energy (fats and carbohydrates): nuts, seeds, tofu, oily fish, dark green vegetables; legumes, starchy vegetables, whole-grain bread, fruits, dairy, non-starchy vegetables. Protein. A protein deficiency may affect IQ and verbal ability of a child. Iron. Iron deficiency may contribute to low birth weight and cognitive impairment. Folate. Folate deficiency may cause serious neural tube defects, such as spina bifida. Vitamin A. Vitamin A deficiency may cause visual impairment or blindness. Iodine. Iodine deficiency may cause mental and neurological problems. Manganese. Manganese deficiency may cause fetal malformations, such as neural tube defects. Vitamin B6. A deficiency of vitamin B6 may contribute to seizures and depression. Zinc. Zinc deficiency disrupts proper fetal growth and may cause low birth weight. Zinc is crucial for proper brain development of children. Here you can find the basic dietary guidelines by Dr.Shannon, a holistic child psychiatrist, for all children. Ensure that your child drinks plenty of water every day. Make sure your child consumes enough protein. Feed them two servings a day of chicken, eggs, fish, tofu, or meat. Feed them healthy fats and healthy oils. Use butter instead of margarine. Serve fresh cooked fish 2-3 servings a week, if possible. Include nuts and seeds as a snack. Also, put nuts and seeds in child’s salads and casseroles. Feed your child variety of cooked and raw vegetables. Feed your child fresh fruits, which are currently in season. Serve locally grown fresh fruits and vegetables seasonally. If the child eats only white foods (rice, banana, bread, cheese, etc), then he is missing out on nutrients. Supplement the diet with brain-building vitamins and minerals. Make your child eat protein-rich breakfast. Refined sugars, candy, juices. Even juices labeled as 100% natural contain enormous amounts of sugar. Caffeine. It has no nutritional value and may cause dehydration. Trans fats, hydrogenated oils, margarine, fried foods. Excessive carbohydrates. Instead, feed your child protein-rich meals which will feed his brain. Ages 2 to 6: A high-quality chewable multivitamin, plus 100 mg of Vitamin C, 100 IU of vitamin E, 250-500 mg of EFAs. Ages 6 to 12: An adult multivitamin, plus 100-250 mg of Vitamin C, 200 IU of vitamin E, 1000 mg of EFAs, 50 mg of B-complex vitamins, 250 mg of chewable calcium/magnesium. Ages 12 to adult: A multivitamin, plus 250-500 mg of Vitamin C, 400 IU of vitamin E, 2000 mg of EFAs, 100 mg of B-complex vitamins, 500 mg of chewable calcium/magnesium. 14-18 years: about 8-10 hours. Exposure to sunlight is crucial for children, especially newborns. Getting enough sunshine is important for normal brain development. Children who don’t get enough sunlight may experience inhibited growth, weakened bones, and mood problems. Artificial light cannot replace natural sunlight. Getting adequate natural light during a day is as important for the brain as getting enough sleep at night. Intense exposure to heavy metals, pesticides, and other toxins is damaging to our general health, including the neurological and brain health. Two most common heavy metals like lead and mercury pose a huge risk to children’s brain health. Lead poisoning causes serious behavioral and cognitive problems in children, like poor memory, inability to concentrate, lowered IQ, irritability, difficulty with motor skills, temper tantrums. Clean floors, and other surfaces weekly. Have your water supply tested for contaminants. Wash fruits and vegetables before consuming. Mercury is another toxic metal which may cause memory loss, headaches, anxiety, irritability, depression, poor cognitive function, and hallucinations. Pesticides are poisons used by farmers to spray their crop. Pesticides are very dangerous to young children’s brains as they have a direct impact on the central nervous system. Even low-dose exposure to pesticides can disrupt thyroid function, impair learning causing inattention. The good news is after only six weeks of eating organic foods, the level of pesticide levels in the body can reduce significantly. Buy organic food, especially fruits and vegetables that don’t have a removable peel. Wash/soak all inorganic fruits and vegetables in water with added apple cider vinegar or a product designed to remove pesticides. Shop at farmer’s market or join a local food co-op. Use glass containers instead of plastic to store food. Don’t heat in plastic. You can grow your own organic garden. Avoid playing in decks or play structures that have been treated with arsenic. Play and exercise in clean and safe places. Install a water filter to avoid water contaminants. Avoid traveling with your child through a heavy traffic whenever possible. Managing stress is a huge topic, but it is the most important one. Parents’ biggest job is to help kids cope with stress and help them learn to manage it. When you help your child learn to cope with stress, you are helping him learn to cope well with life too. Keep your home clean and well stocked with food and supplies. Make sure your child eats well and gets enough sleep. Maintain open communication by naming the stress, talking about how it’s affecting them, and openly strategizing about how best to contend with it. Provide support and encouragement. During times of stress, parents need their children know that they are aware of the stress and that they are there for them. Work to build your child’s sense of self-esteem by giving him appropriate responsibilities (like doing chores), letting him make decisions, and offering appropriate praise and encouragement. Children copy you, so model appropriate coping skills by showing them by example how to cope with it with skill, grace, and calm. Show your child that stress is normal, manageable, and temporary. Nurture problem-solving skills in your child by clearly identifying the problem and generating a list of possible solutions. Praise if the chosen solution works and encourage if it doesn’t work. Making mistakes and learning from them is a part of developing strong problem-solving skills. Teach assertiveness. Children need to learn how to stand up for themselves in stressful situations. You can use a role-playing stressful situations technique to teach to stand up for themselves in appropriate and nonaggressive ways. Assertiveness is a learned skill and parents need to help their children develop it. Help your child develop an appropriate sense of humor. Help him learn to not take stressful situations too seriously. If your child can see the humorous side of things he can handle stress better than those who are too hard on themselves. In stressful periods of life, encourage your child to recharge his brain by participating in relaxing activities like reading, playing a game, making art projects, or play sports. Exercise is a wonderful stress reducer. Source: Scott Shannon’s “Parenting the Whole Child: A Holistic Child Psychiatrist Offers Practical Wisdom on Behavior, Brain Health, Nutrition, Exercise, Family Life, Peer Relationships, Shcool Life, Trauma, Medication, and more” book. Hi! My name is Feruza. I am from sunny Uzbekistan. Currently, I am a stay at home mom of two beautiful boys and have a wonderful supportive husband. I hold Masters' degree in Multimedia Engineering, but at this moment, I am just a Mom. With all my love to my family, I try to nourish them with wholesome foods always trying and experimenting new recipes. My hobbies are languages, healthy lifestyle, nourishing food, books, sewing, knitting, DIYs, homeschooling, and much more! I felt the need of my own corner where I could collect all of my favorite recipes and information without losing them. And here it is! Enjoy! I may be an affiliate for products that I recommend. If you purchase those items through my links I will (or may not) earn a small commission. I only recommend products & systems that I use and love myself, so I know you’ll be in good hands. You will not pay more when buying a product through my link. In fact, I oftentimes am able to negotiate a lower rate (or bonuses) not available elsewhere. Plus, when you order through my link, it helps me to cover the expenses of running this website. Thank you, in advance for your support! Amazon disclosure: OrganicBioMama.com is a participant in the Amazon Services LLC Associates Program, an affiliate advertising program designed to provide a means for sites to earn advertising fees by advertising and linking to Amazon.com. * DISCLAIMER: The information on this website has not been evaluated by the FDA and is not intended to diagnose, treat, prevent, or cure any disease. The content on this website is intended for informational and research purposes only and not as a substitute for the medical advice, treatment or diagnosis of a licensed health professional.